David Alward, the Canadian Consul General in Boston (far right) paid a visit to our first U.S. Crossover Ambulance customer in Danvers, MA earlier this week. Kevin Lyons of Lyons Ambulance Service is at Mr. Alward’s immediate left. Also on site that day were representatives from Opportunities New Brunswick (from left: Serge Doucet, Vice President of Business Development, Suzanne Turmel, Manager, Export Unit and Stephen Lund, CEO. 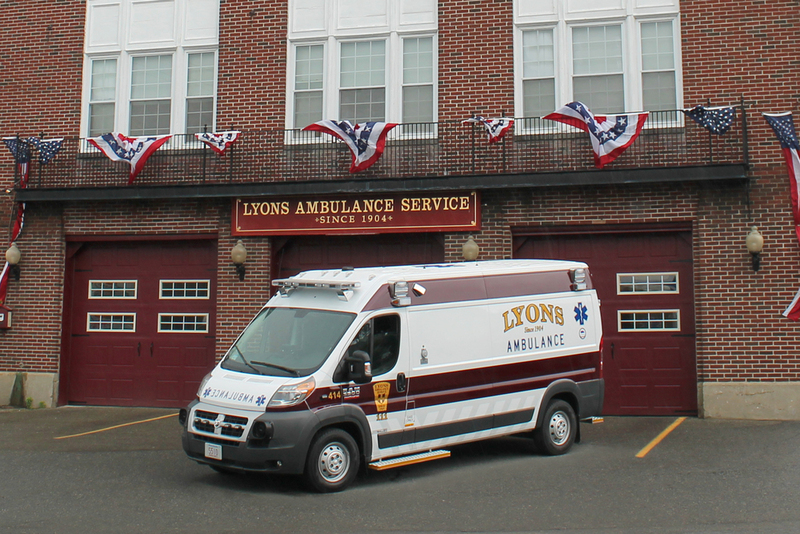 Lyons Ambulance Service of Danvers, MA can trace its roots back to horse and carriage days. While 1904 marks the company's official inception, the entrepreneurial Lyons family started out in the livery business in the 1890s. Kevin Lyons is the fourth generation of family members at the helm of Lyons Ambulance Service. 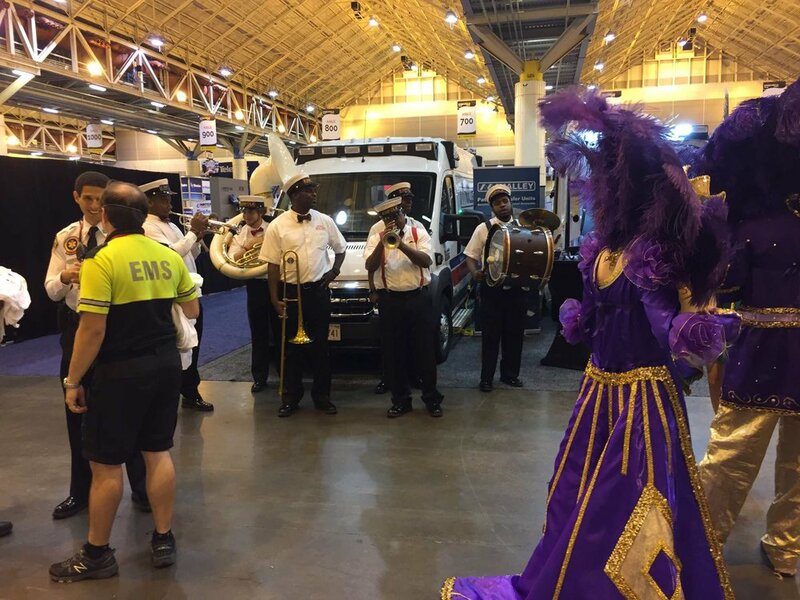 Headquartered in a restored fire station, Kevin Lyons shares his insights about the evolution of ambulance transportation and the innovative new Crossover Ambulance conversion he’s embraced to enhance the safety and fuel economy of his fleet. What’s the Lyons Ambulance Service story? My great grandfather was in the livery business. His stables were the equivalent of today’s automotive garage. He would hire out a horse and buggy and a driver for a Sunday afternoon. Not everyone had a horse and wagon or the means to get to the hospital so he would get calls to bring someone to a hospital. He purchased his first ambulance coach in 1904. Several of my great grandfather’s kids got into the business, including my grandfather, Clarence. When my great grandfather passed away his sons took over the ambulance service and started a funeral home. Eventually my grandfather’s brothers went their own ways and my grandfather ran the ambulance service and funeral home. My father, Clarence Jr. “Junie” and his brothers, Bill and All, worked together. I was only two years old when my father took it over. When did you show interest in the business? I went on my first ambulance call when I was only 12 or 13. I was a big strong kid and was able to lift. My wife, LeeAnn and I have been running the business for the last 20 years or so. We have six kids and most have worked here in some fashion. Two have taken over the funeral home. How do you balance family and a business? LeeAnn works side-by-side with me. She handles the paperwork, admin stuff and keeps me focused and in line. We’re a team. How did establishing your headquarters in a historic fire station come about? This four storey building was built in 1850 and served as a shoe factory until the 1920s when the town purchased it and converted it to a fire station. The town had been trying to get a new fire station built for many years. It went out for public bid and I was the only bidder. That gives you an idea of the condition. It cost more to restore than to buy. We moved in Mother’s day of 1997. What’s the size of your fleet and the area you serve? We have 21 ambulances; a mixture of Type ll, Type lll, one Type l, plus 12 wheelchair vans. We serve the north shore of Boston between Boston and the New Hampshire border and respond to between 40,000 to 50,000 calls per year. How have you seen the industry changing in recent years? Obviously, regulations are much more a challenge than they once were,, not only with the department of public health, but also those placed on us by the federal government, This has increased the cost of operations substantially at the same time when reimbursement is being cut everywhere. What about the changes in vehicle platforms? I had been following the pending demise of the Ford van and seeing the eventual demise of the GM van which we have also been using. The ProMaster caught my eye as something coming forth from the automakers. It looked like it was a better platform. What firsts have been introduced by Lyons? We had the first ambulance coach north of Boston. We also had the first wheelchair vans in the area and were one of the first to run advanced life support. We purchased our first box ambulance in 1974 and in late June of this year, we put a Malley Crossover Ambulance into service. We’re the first ambulance service in the U.S. to do so. What do you mean by a Crossover Ambulance and what are your observations? It’s a van ambulance using a RAM ProMaster and the way it’s designed and manufactured it has as much space as a mini modular ambulance. The load height is really low (21”) and the headroom allows someone 6’3” to stand up. It can also hold a bariatric stretcher. So far it’s working out very well. The ergonomic design and composite interior really improves crew comfort and safety. The crews really like the comfort of the cab set up and the rear setup reduces reaching. The low load height makes it easier to get in and out of. What do you like about the composite interior? It looks good and it looks like it’s going to be very easy for upkeep. It’s also really light so it’s not taking up usable payload; the fact that the interior and cabinets are designed to make use of the ribs and contours of the van maximizes interior space. Are you seeing fuel savings? It’s giving me better fuel economy than with typical Type lls, and significantly better than a Type lll. Everybody who gets in it is amazed by how much interior space there is. It’s comparable to one of the smaller, box ambulances. Initial costs are certainly more economical than the purchase of a mini mod, and they don’t have any advantage storage wise. Can it compete with a full size modular? It can in some instances. I would certainly look at It. It would make a good ALS transfer truck where most times that’s done in a modular. There are certain instances where you would not be able to use it but I think that most ambulance services could work around it. We transfer a lot of patients to tertiary care facilities. The ProMaster would be ideal for these types of transfers. Although it can’t accommodate a CPR seat, these are not as efficient as a chest compression apparatus. 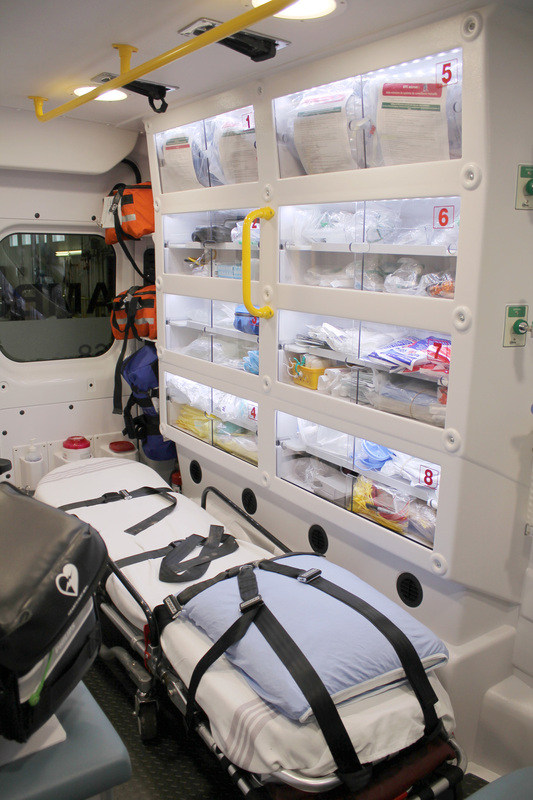 Even with the cost of this apparatus; it’s still less expensive to have a Crossover Ambulance on a ProMaster than a box ambulance with a CPR seat. The fuel economy alone makes that an easy decision, but you also need to look at the physical demands CPR puts on your staff. What ergonomic features are notable? My staff really notices the ergonomics and comfort of it to work out of. The cab is much more comfortable and user-friendly. The interior setup is designed to have everything easy-to-reach. The stair chair on the side is much easier to access instead of having to climb into the back. Being front wheel drive, it handles very well. it only took me about an hour to get the feel of it. I drove that van with no weight in it at all and it handled really well even in snow and ice. What advice would you have for other ambulance services looking to make changes to their fleet? Take a good hard look at everything that’s coming out. Really look at the specifications on the chassis and what converters are doing with them. Malley is the only one with an ambulance conversion on a ProMaster. I had never heard of Malley until about this time last year when I saw a Malley sticker on an ambulance and Googled the company. I’ve purchased trucks out of Canada before. I contacted the company and Terry Malley got back to me personally. It’s nice having the owner of the company phone. There’s a real connection. It makes a difference. Kevin Lyons, fourth generation at the helm of Lyons Ambulance Service (right) accepts keys to America’s first Malley Crossover Ambulance from the manufacturer’s President & CEO, Terry Malley. Ergonomic and fuel efficient, the Crossover Ambulance on a RAM ProMaster is popular with staff and providing significant fuel savings. America’s first Crossover Ambulance went into operation at Lyons Ambulance Service in late June.